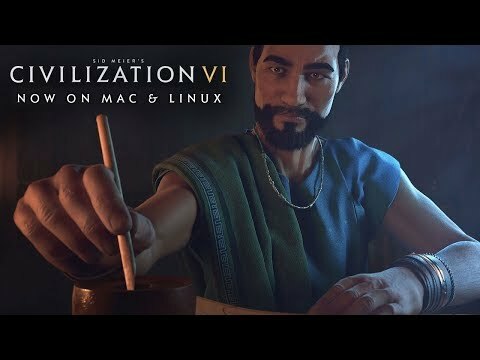 Sid Meier’s Civilization VI, winner of 15 E3 awards including Best PC Game and Best Strategy Game, is the next entry in the popular Civilization franchise, which has sold in over 35 million units worldwide, including more than 8 million units of Civilization V.
NOTICE: ATI and INTEL video cards are not supported to run Civilization VI LINUX IMPORTANT NOTICE: Some Intel i3 Processors may require an additional 2 GB Swap Partition. ©2017 Aspyr is a registered trademark of Aspyr Media, Inc., and the Aspyr star logo is a trademark of Aspyr Media. Mac and the Mac logo are trademarks of Apple Computer, Inc., registered in the U.S. and other countries. All other trademarks and trade names are the properties of their respective owners. Take-Two Interactive Software and its subsidiaries. Sid Meier's Civilization, Civilization, Civ, 2K, Firaxis Games, Take-Two Interactive Software and their respective logos are all trademarks of Take-Two Interactive Software, Inc. All other marks and trademarks are the property of their respective owners. All rights reserved.